After London, elegant, Imperial Vienna has long been my second-favorite world capital city. The main boulevard, the Ringstrasse or Ring Road, turns 150 years old this year and I can think of no other street that embraces such a multitude of monuments, palatial buildings, incredible architecture and vast city parkland as the urban blueprint that encircles the Altstadt, Vienna’s Old Town. I have toured Vienna in each of its seasons and while the Christmas season out-sparkles any other, there is really no “off” season in Vienna. First-time tourists to Vienna are pleasantly surprised by the city’s blooming springtime. From the end of January to early March, the Vienna Rathaus (the spired Town Hall), is transformed into a gigantic ice skating rink. By late March, however, emerging blooms dot parkland and café window boxes. In Vienna a wool jacket or raincoat gets me through March and April. But there’s no need for them come May when the temperature nudges upward and makes the city lovely for strolling and people-watching at outdoor cafes. 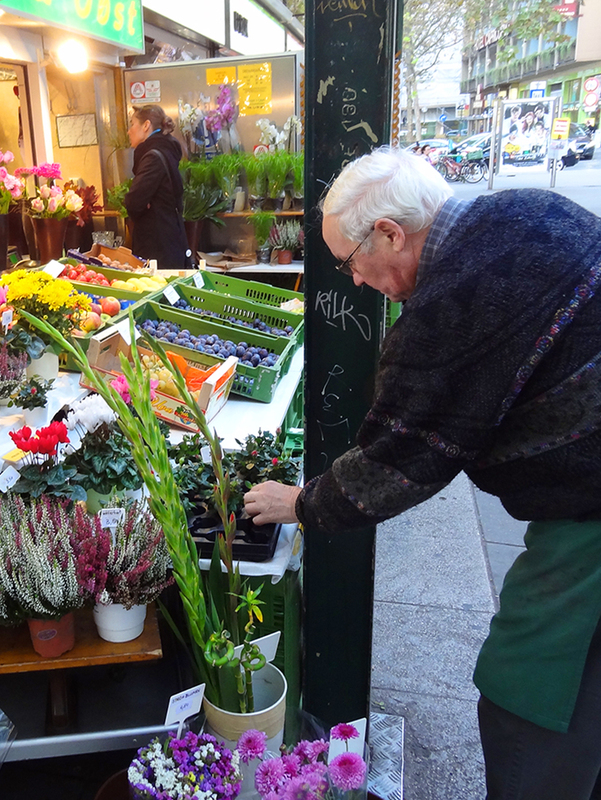 Street markets explode on the scene in early spring and as the flowers burst into color, cafés begin stationing tables and chairs outside. 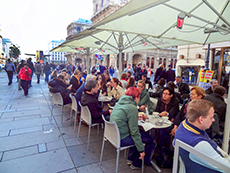 Grab a seat at one of them, nibble on pastries, sip Viennese coffee and watch the world go by. 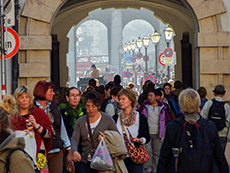 While winter may feature balls and ice-skating on the grounds of the Rathaus, early spring gives way to Easter markets that spring up around the Old Town, Schönbrunn Palace, Prater amusement park and in upscale neighborhoods. Colorful Easter eggs and marzipan bunnies take center-stage at the markets, as do a plethora of kids’ activities and entertainment. No matter when I am in Vienna, I always make a trip or two to the Naschmarkt (6 Wienzeile) for hot international foods and pashminas. The Karlsplatz U-bahn station is closest to the Naschmarkt but if you are staying in the Rathaus area, you can make a leisurely walk of it. I do. At approximately three miles long, the Ringstrasse anchors many of Vienna’s most important and storied buildings. And while this year’s 150th anniversary of Vienna’s Ringstrasse will include many special events, there are always special events on the fabled roadway, even in off years. It anchors numerous notable buildings including Parlament (as it’s spelled in German), the Rathaus, the Burgtheatre (Austria’s National Theatre), the 650-year-old University of Vienna, the State Opera House, Kurs Salon concert hall and the fine-art Kunsthistorische Museum and Naturhistorisches (Natural History Museum) that face each other across Maria-Theresien Platz. The Kunsthistorische is one of the world’s greatest art museums, right up there with the Louvre and the British Museum and although I often linger in the Egyptology section, I realize that most art lovers come for its renown collection of paintings. If you love Dutch or Flemish masters, this is the place to be. The Ringstrasse is identified all along its route by site names, from Schottenring to Universitat Ring to Paul Renner Ring, from Opern Ring to Karntner Ring and attractions in between. The Old Town is compact and is accessible from pretty much anywhere on the Ring. Two wonderful city parks are also tucked in along the Ringstrasse. In City Park, not far from the Opera House, a gilt statue of Johann Strauss befittingly adorns the landscape while over at the Volksgarten (the People’s Garden) thousands of roses fill the air with perfumed fragrance come the warm weather. 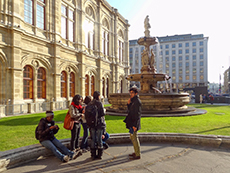 At lunchtime, college students and business people take to the benches in the Volksgarten. When my granddaughter was eight months old, her parents fed her jars of baby food as they sat on the same benches and it’s still one of my sweetest memories. 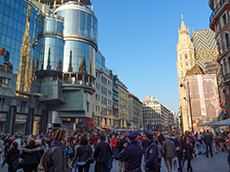 Kohlmarkt, Graben and Karntner Strasse, renowned for some of Europe’s most expensive stores, intersect to form a pedestrian oasis that showcases the splendor of imperial Vienna. St. Stephen’s Cathedral, surrounded by cafés and Viennese konditorei, anchors the heart of the shopping district. To make my way to the shopping mecca around St. Stephen’s Cathedral, I usually cut through the gardens opposite Parlament, crossing in front of Hofburg palace, home to the president of Austria. Next to the palace is the Spanish Riding School, showplace of the majestic Lipizzaner stallions. When the horses are in town, they are stabled around the corner from the theatre, just a minute from the corner of the most illustrious shopping street in Vienna, Kohlmarkt. On that same corner you’ll find another historic place. The landmark, which our family has photographed dozens of times, is the famous 100+-year-old “Manz” Bookstore at Kohlmarkt 16, the largest in Austria. It’s not on any map that I know of, but it should be. Manz is worth a visit (even if your last name is not “Manz”) and it’s my favorite. Another favorite is Café Landtmann (Universitätsring 4) across from Parlament. 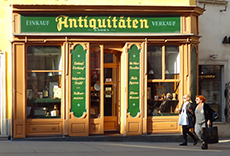 It’s a venerable but not stodgy Vienna institution with delicious coffees and beautiful pastries, as well as a superior Hungarian goulash. Even on the briefest of stays in Vienna, I make it to Café Landtmann several times. For a larger selection of goulash, head over to the Gulaschmuseum, which is not a museum but a restaurant, located a few minutes behind St. Stephen’s Square at Schulerstrasse 20. Don’t be surprised – as I was – to be served goulash with a fried egg on top. There are a lot of “day-trips” outside Vienna, raging from excursions to the Vienna Woods to wineries, but unless you visit Vienna often you’ll find plenty to keep you entertained in the city for a week, from museums to concerts to shopping and outdoor recreation. The Vienna State Opera broadcasts selected performances live beginning in April, the same month the Vienna Marathon attracts world-class runners mid-month. In early May Austria regional cuisine is showcased in the Genussfestival in the Stadtpark and later in the month the Vienna Philharmonic gives a popular free open-air concert in Schönbrunn Palace Park (this year on Thursday, May 14). The 60th Eurovision Song Contest, a popular major European music competition, is hosted by the city of Vienna at the end of May. Concerts continue throughout the spring and at the end of June Vienna plays host to the Vienna Jazz Festival. Every year the city kicks off summer with the Danube Island Festival…but summer’s another story. As a travel professional one of the first specialist-training programs I took was the “Vienna Expert” program, where I was introduced to Vienna’s tourism web link, which I still keep on my computer’s toolbar. It’s a fantastic resource that you can use also: go to http://www.vienna.info/en. For a “map” of the most significant buildings along the Ringstrasse, visit http://ringview.vienna.info/en/. Vienna has a wealth of exceptional hotels. I usually stay at the Hilton Vienna Plaza on the Schottenring and have also stayed at Le Meridien, as well. 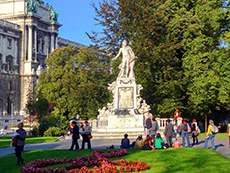 Le Meridien is near the Vienna Opera, and only a short walk to pedestrian shopping. I recommend to my clients that they stay along the Ringstrasse since there are hotels in a variety of price-points and there is nothing comparable to staying centrally located. Most likely any hotel along the Ringstrasse will fit your purpose. You can skip the over-priced common pastries and chocolate confections at the iconic Demel and head instead to one of the Old Town’s many uber-delicious pastry-and-coffee houses. I like Aida for pastries and Café Landtmann for anything, especially its coffees (http://www.landtmann.at/en/the-cafe-landtmann.html). For a real treat take a horse-drawn carriage ride through Old Town. 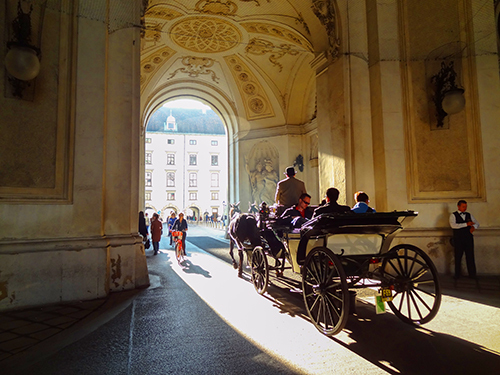 Horse cabs pick up passengers in the Hofburg Palace area and next to St. Stephen’s Cathedral.